We need a mold of your teeth to make your grillz. Here are 2 options to help. 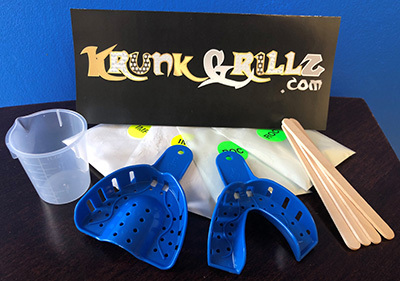 Buy your mold kit at the same time as your grillz. Click "Add Mold Kit" when you buy your grillz. We will ship your mold kit today, then we'll wait for you to send your mold back to us. Buy your mold kit below and we ship it today. Then, order your grillz later. Just send us a copy of your grillz receipt with your finished mold and we will start making your grillz. Includes step-by-step instructions, mouth tray(s), mixing sticks, measuring cup and powder. You will receive a color instruction manual with your mold kit. We recommend you watch the video above and read all instructions before you mix anything. Measure out 40 mL of IMP powder and pour it into the bowl. Measure out 30 mL of water and pour it into the bowl. Use your mixing stick to mix the powder & water until it's completely pink. It should look like pink peanut butter. Use the mixing stick to put your impression mix into the mouth tray. Pull your lip away from your teeth, place the tray into your mouth, and push it straight and evenly onto your teeth, without biting. Hold the mouth tray in your mouth for 2-3 minutes. You can remove the tray when the leftover mix in the bowl turns white with no pink dots and is rubbery. Tap the entire tray upside-down on a paper towel to empty the excess saliva. Ensure that you can see the outline of all your teeth and your full gumline & that your impression is clean. Set aside and allow to dry while upside-down for about 10 min (No longer than 30 minutes because it shrinks). Peel the white imprint out of your bowl and make sure it's clean for next step. Measure out 30mL of ROC and pour it into your bowl. Measure out 10mL of water and pour it into your bowl. Use your mixing stick to mix ROC and water. Grab your blue tray with dry IMP and pour a little bit of ROC into each tooth. Wrap a paper towel around the entire tray and tap the tray hard on the table to remove air bubbles. Prop up the edge of the tray so it's level and pour remaining ROC while poking it with the stick to remove bubbles. Fill the tray to the top with ROC. Set the tray aside and let the rock dry for 4-6 hours. Turn tray upside down and remove white imprint that leaked thru the bottom and sides. Use a butter knife to gently pry ends of mold, back by the molars, out of the tray. Remove the mold from the tray. Carefully peel the white impression away from the green rock. Check for full tips on teeth and clean and visible gumlines in the front and back of green mold. If you are unsure of mold please email a pic to us. Ensure mold is wrapped up securely in paper towels or bubble-wrap. Package your mold (the original box can be used to return mold). Ensure that the name and address on the box/shipping label match the name and address used when ordering.